I saw the above quote and snagged it. It is so true. Alot of artists, new artists, people wanting to be and so on, ask me "How do you make it as a working artist". Okay, I'll start passing on things you will never learn in art school. I was offered, in 1979, the chance to go to a MAJOR art school in Providence(no names but guess). The tuition was a paltry $12,000 year(then). My folks said "we'll do whatever it takes, IF you want to go". Well, two tours of this place proved me otherwise. I couldn't see it. Then, the focus of most schools was this post-modern non-representational art that, I thought kinda sucked. So, instead I went to a smaller, CHEAPER state school that had teachers from the same place. I stuck it for 18 months and realized this just...was not...me. I quit and went to work, eventually in an art supply store and, not only made contacts, but got free supplies("sales samples" I was asked to test and report back) often, and got asked to sit in for FREE at classes at that very art school that now wanted closer to $14K a year. I realized something about college in general that misses the mark. They don't teach you plain ol' COMMON SENSE. My late Dad always talked about this, mightily saying that if nothing else, you have to have that. You can be smart, get good grades, but "common sense must prevail", to quote him. Nobody tells you to think outside the box, or think in a business way, or think in several directions at once. They teach you one way of doing something and that has to be *the* way of doing it. And then you get after much money is spent, a piece of paper that tells people that's what you do. And without Common Sense, it's just a "piece of paper". The result is, you get alot of people that get out of school and have no clue how to go about the basics of anything-whether it be a drawing, or just taking care of your health. Use some common sense and try alot of different styles and ways of working-and thinking. That's what I did. There's an old addage that suggests if you do just one thing, and one thing only, you'll be the best at it. I don't agree. I get letters and people asking me "Why did you leave space art?" Well, I didn't. I still do it. But I do lots of other things and this keeps me constantly busy. I have to. That's just good business otherwise I would be in trouble. The problem with some aspects of SF and fantasy art is that people think it's some kind of religion. It's not. It's business and, the trick is always keeping yourself a little edgy and coming up with new ways of going about things. 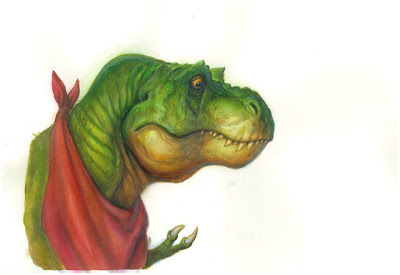 On the dinosaur book I'm working on, I had a real quandry how to make the project work. So at 6am one morning I had a brainstorm and devised, in theory, how it could work with two people doing the art end of things. How could I take, traditionally done art, and make it work, converted into photo backgrounds? Cortney Skinner provided the answer and now we have an artistic collaboration that the client is now loving what they see. I realized I didn't learn this in school, I just kind of used some common sense, and got the way to do it. It's thinking outside the box. The other truism is that, the geeks, weirdos and non-jocks-in High School-all went out and did the cool stuff. The jocks and "play-it-safers" all got into real estate(yike! ), the stock market(double yike!) or became lawyers(YIKE YIKE YIKE). It's like case after case. 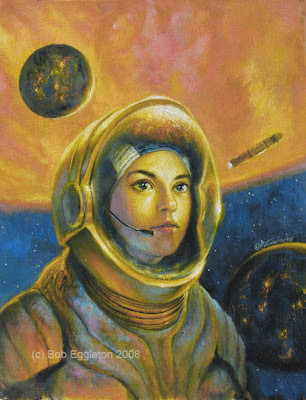 Not a painting of the day, but, a cover piece to a upcoming special edition of stories about Honor Harrington, by David Weber for Subterranean Press due out later in the year. I got on a portrait kick again-to digress I did portraits back 30 years ago in High School, and made money drawing pretty girls and families around Christmas time. Hey it was better than what most High Schoolers were doing which was waiting on tables. My recent portrait cover for Teddy Roosevelt for the same publisher re-awakened my muse to do these. Honor is, in this story, in her teens. She has eyes that are slightly Asian, a feature a borrowed from a dear friend of mine for the last 28 years. She also is part other ethnicities as well, so I dialed all that into the final image. Because it was more about Honor than, say, action, things blowing up(which the covers for his mass market books do quite well) I wanted to tone it down and just do a comtemplative portrait, in some kind of space gear. Anyway, I did the painting 14x18 inches and in oils. Alot of fun. I need to do more portraits. When I exhibited my Roosevelt piece at the World Fantasy Con, alot of people were shocked at me going into portraits as in "You do THIS too?" Sometimes, you have to think outta the box. It was also a nice break to do this from the dinosaur book. Fredric Edwin Church, that is. Nice little painting done as a copy for a "Fakes, Frauds and Forgeries" show at a Newport gallery this weekend. I had alot of fun with it, again, studying Church's lighting and his palette. He's only one of the finest painters from the Hudson Valley River movement. He also painted places in South America that truly made them look like another planet. He tended to make the real, surreal and stirring. Perhaps my most favorite painting of his is called Cotopaxi Eruption. He had a transparency to his work, and a detail that in reality was only hinted at rather than having really tight detail. The true mark of craftsmanship we all aim for. More progress on the dino book. 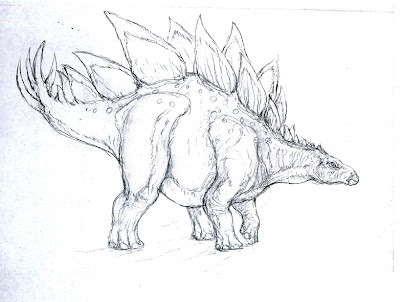 Here's the Stegosaur from a couple of posts ago, as a sketch, now fully rendered and ready for digital insertion into the stock photo. I think he came out pretty cool. And it progresses along... I rendered it in watercolors on watercolor paper, and colored pencils for the highlights. A great medium to work in. I used some airbrushing to blend some colors and apply layers. It's not new information that I love giant monster films. That's a given. When that "mystery trailer" showed up in theaters this past summer, it certainly piqued my interest. Well, with $41Million in the box office over the weekend, it seems to have struck a chord with alot of people!! On the whole, I liked it. I'd give it a "B". The whole shakey-hand-held-camcorder "cinematography" was, oddly professionally done, and we had moments of total chaos and blurred images to moments of being settled down, alternating, just so the audience wouldn't be getting the heebie-jeebies. 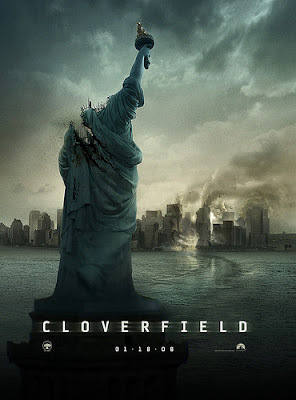 During a party for a young guy, going to Japan(in-joke) for a high end job situation, a disaster starts happening in New York City. Soon it becomes evident something huge and alive is wandering the streets and destroying everything in sight, and spectacularly. And the film is presented as something found by the military and sequestered to possibly shut down any evidence of this event having happened. We see an opening set of color bars and then a "US Dept of Defense" logo watermarked into the tape designating that it was found at "Sector designate: CLOVERFIELD" which was "Formerly location: Central Park". It's a giant monster, it's origin unknown but, perhaps hinted at if you look close enough. It is NOT Godzilla, as so many rumors persisted. It's not a Lovecraftian thing either but it does look very weird in a simplistic way. What follows is pretty scary and, I won't reveal too much, only to say, go see it, failing that watch the DVD when that comes out. Possibly the most realistic monster film I have ever seen. Plays upon fears and jitters post 9/11, as the original GODZILLA played up and personified fears of nuclear weapons for Japanese audiences, over 50 years ago. The sight of buildings collapsing, exploding, is very realistic and intended to give us a feeling of deja-vu of those terrible days on and after 9/11/01. The film is not for everyone, nor do I think it will breath life back into Godzilla, but it's certainly a fun, scary romp. Oh, and stay for the credits. We're treated to a terrific piece of music-the only "theme" done for the movie-called "ROAR!" which is a terrific and purposeful homage to ALL monster movie music from the 1950's. It's terrific and one of the best aspects of the film. 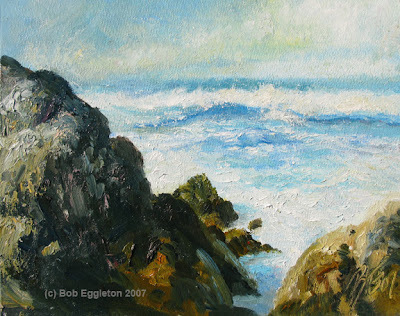 Roiling Pacific(8x10, oils SOLD) I think I will be on an ocean kick for awhile. I love painting it. Painting water is pretty much alot of fun because it's always like frosting a cake to make the waves work and appear moving, yet in a quick few strokes. This happens to be from around the Monterrey area and of course, the water has a very different color to it than the Atlantic. It's this deep, turquiose blue. Yet, such colors can be pretty invasive when trting to balance them out with others. Still, I like how it turned out. I'm taking some time off(about a week) from the dino book, as Cortney has more work cut out for him than he can do at the moment, so I am turning myself to more small paintings and some cover work that needs to get done. 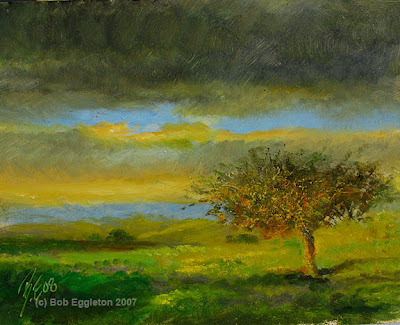 Tree on The Moor(8x10,oils $100) George Inness was my inspiration here. Nick Jainschigg and I got talking about him as an influence. He had a way of depicting some subtle landscape colors, lost edges and just dashes and scrapes of color. I based this, I confess, on a rather cool postcard I received. Changed things of course but used the overall lighting as my inspiration. The tree was interesting as it had no leaves on it. I used a big brush and pulled back from the temptation to put in alot of detail, something I need to bring myself up on as was the purpose of this whole venture anyway. 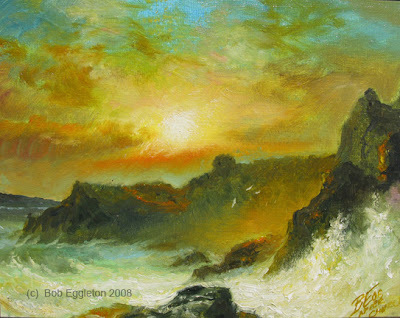 A note here-I suspect I'll be posting several paintings per week, than on a daily basis. It just works out easier that way for me and feels less of a chore. Well- a painting! I really miss doing these with the pace I was doing last year. What can I say? Things got really super busy. But I am at that time of year that I start missing "green". Leaves, grass, etc. Granted it's been incredibly mild this month, and I say "bring it on!" if we have more warm days ahead... I did this based on some photos I had from Oregon. 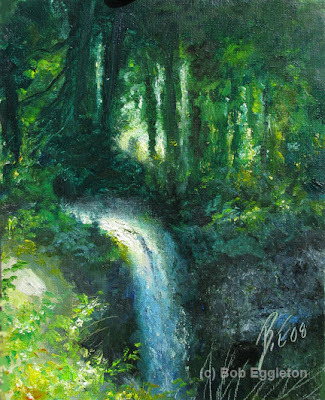 The forest was lush and rich and I attempted to capture the feeling of a far off sliver of light. The falls drop off about 70 feet, so it's vertiguous to look over the side of the cliff. Not that I would have cause to. My fear of heights is paralyzing. Even standing on a chair is an issue for me. Anyway, I have a bunch of new pieces all in the waiting and planned. More to come, so enjoy!!! 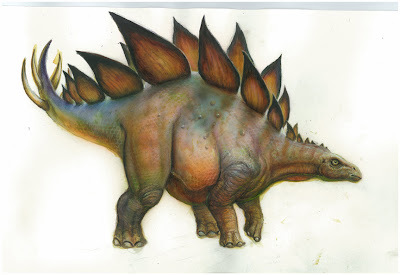 Been somewhat busy and, deep into the dinosaur book. I'm still here, just alot going on these days. More paintings to come as the Newport gallery opening went really well, so I have to produce more work for it. King Kong '33 (oils, 8&1/2 x11 SOLD) So I'm back. I was invited into a gallery theme show "Paint Your Favorite Movie" and, no it wasn't Godzilla. It's KING KONG 1933-a film I could watch again and again and never tire of. I think Peter Jackson did an admirable and amazing job of his '05 update of KONG, but truly, the charm still goes to the 1933 one. And because of that film we had all the other "giant monster" films of the 1950's and beyond. 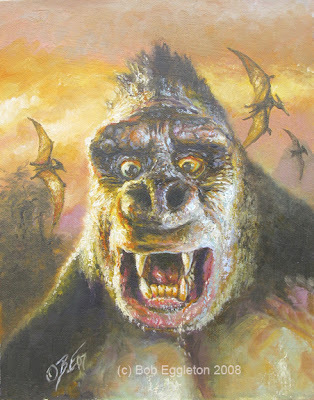 So I did this little painting, done for the show, and based it on a famous close up photo of what is referred to as the "chubby faced" stop motion model(there were six models used and two were used in famous publicity shots which is why Kong looks so different in shot to shot). The only thing was it was a black and white film and, I wanted to do this in color, and rather quickly as I didn't have much time to get things together. A note-if the painting doesn't sell in the show, I'll re-post with the price on it, afterward. So check back if interested. In the meantime, my wife and I will have the "guest artist" spot on the back wall of this same gallery-Springbull Gallery in Newport with a number of small paintings up. And it's back to doing some more paintings for me!!! I took a bit of a rest over the holidays, which I was very grateful for. Everyone needs rest-I say this to all artists. No good health, no good art.